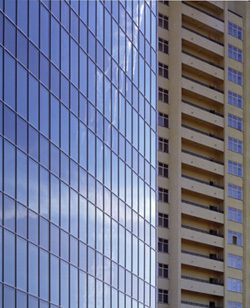 Body tinted glass products are produced by small additions of metal oxides to the float or rolled glass composition. These small additions color the glass bronze, green, blue or grey but do not affect the basic properties of the glass except for changes in the solar energy transmittance. The color is homogeneous throughout the thickness. Most float glass products contain small amounts of iron oxide which produce a green tint usually only perceived when the glass pane is viewed 'on edge'. Additional iron oxide is introduced to produce green tint, cobalt oxide for grey tint and selenium oxide for bronze tint. To produce a blue tint additional cobalt oxide is added to the float glass composition. These products are perceived as giving weak colors by transmitted light. They do not produce high or significantly colored reflectances. Usually their principal external visual characteristic is their lower light transmittance. Most low-e coated glass is produced by applying a special coating to sheets of finished glass in a process called sputter coating. These "soft coat" products have some limitations. the coating can be scratched or damaged, and can potentially deteriorate with exposure to air, giving the product a limited shelf life. Much of the fabrication process, including bending and tempering, must often be done before the glass is coated. Edge deletion is usually recommended for soft coat insulating glass units. Our low-e products are produce by a patented pyrolytic process that exposes hot glass to chemical vapors during the actual float glass production, where they bond to the glass on the molecular level. Having a pyrolytic surface, fired on at over 1200ºF, pyrolytic products are durable, bendable, and post-temperable. In addition because the pyrolytic surface doesn't degrade like a sputter coating, it can be warehoused locally for availablility, reducing project lead times across the country and around the world.